We're blessed to live in an area that's bursting with outdoor activities and amazing places to visit. We love spending the summers at the beach, and we always try to make it up the mountain at least once in the late fall. Unfortunately, neither of our vehicles were up for the challenge this year. When DriveShop offered to let us try out a 2017 Mazda GX-5 for the week, I was thrilled! Not only because I got to drive an amazing, sporty car for the week (for comparison, I drive a 2005 minivan with 225k miles on it....), but because I knew we'd be able to make our annual trip up Mt. Baker! The drive is usually a little strenuous, but we honestly hardly even noticed it this time! The CX-5 handled it like a champ. It's a cool vehicle because it feels like you're driving a sporty little car, yet I could easily fit all three carseats in the backseat! 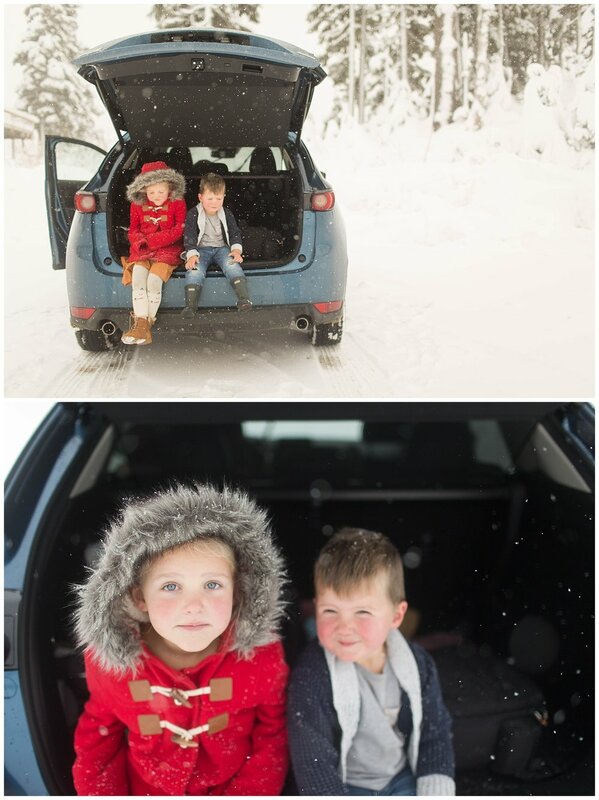 The kids appreciated the trunk space when they ran back to rest after playing in the snow for a bit! We cranked the heat and popped the back and they had the perfect resting place. There was even enough room for them to spread out and eat their picnic lunch! After playing for a while, we headed back down a ways and ended up at Nooksack Falls. It was crazy how cold and snowy it was at the top, I was grateful for the heated seats and steering wheel! Austin (aka: Scrooge) even let us listen to Christmas music! Since the mountain's not open for skiing yet, it was so quiet and peaceful! The waterfall was cool and all, but I was distracted by this sweet baby and those delicious cheeks! The kids loved hiking around the snowy forest and it was so gorgeous! We could have stayed all day! A quick nursing break for Felix and we were on our way back down! While the mountain is lovely, it's not my favorite drive in the dark! The CX-5 sure made the drive easy, though! It has auto-lights, even sensing when someone was coming towards us to turn off the high beams! The windshield wipers turn on automatically too! The kids thought it was a magic car, and I kind of agree. Thanks DriveShop and Mazda USA for letting us enjoy this annual trip! We loved the Mazda CX-5!